Lyle: This series of lessons is for guitarists who have never played slide guitar. It's not as hard to learn as you might think. It doesn't matter if you use an acoustic or electric guitar, these lessons can be learned and played on either type. Lyle: If you don't have a slide, you can pick one up for under $8 at your local music store. There are glass, ceramic, brass, and steel slides and they are available in many sizes. I like the steel ones because they don't break! You can use them on your ring finger or your pinky. Lyle: Notice its smack dab on top of the fret wire. Also, don't press down very hard on the strings; just glide the slide over them while dragging your index finger along the strings behind the slide. This will help mute unwanted noise. Lyle: I'm going to take you through a series of simple exercises and riffs for most of this lesson, then teach you a simple solo that you can learn to play along to a jam track. Lyle: Here's the first exercise. Play the open G string, and then slide up the 4th string to the top of the 5th fret, which is a G note. You only want to hear one note at a time. 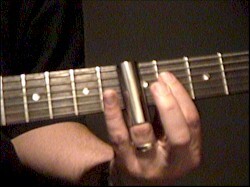 The purpose of this exercise is to help you get "in tune" and getting you used to playing on top of the fret. Lyle: The open G string acts as your target pitch, and then you slide on the 4th string to the 5th fret, matching that pitch. mattbusby: Are you dampening your index finger behind the slide? Lyle: Try this next exercise using the 3rd and 2nd strings. Add a little vibrato at the end of each slide. Lyle: Now let's try playing a scale on one string. 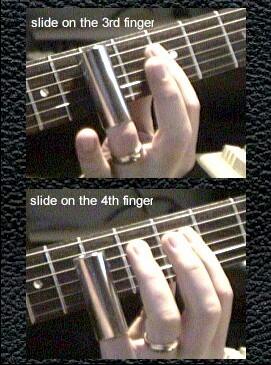 Play this G minor pentatonic scale using a finger, and then copy that using the slide. Lyle: This next exercise is the same scale but this time you'll be sliding into each note. Lyle: Let's try a few simple chords using the slide, G (open) - C - D - G (12th fret). dave: What does the circles mean? Lyle: Those are the root notes of each chord. If you play the tab file back on the virtual fretboard, you'll see the root notes are labeled and highlighted. bluesguitarmp3: What size slide would you suggest I get teach? Lyle: One that's not too big and not too small I guess. I found a size that doesn't fall off my finger from being too big. T: Do you recommend big or small string gauge set up? What about fixed versus Floyd bridge? Lyle: I play slide on any type of guitar, any gauge of strings. It's easier to start out with heavy strings though. Lyle: Here's an example of where and when to play the chords. Remember the G chord can be played open and at the 12th fret. Lyle: Next is a fancier way of playing the same chords. dave: In bar 12 are you muting the last three cords between moving the slide? Lyle: Dave, I'm not muting there, just moving fast. T: Do you recommend distortion or clean sound? Lyle: For slide I feel it doesn't matter, as long as you can hear what you're doing and just go for it.